Thoughts on doll making, fiber arts, and creativity. Just been watching the Theriault's June 18th Online Auction. I wish I had the money to buy some of this dolls. You can see some of Martha Chase´s dolls, some Lenci's and some Native American cloth dolls among the bisque dolls (including a tiny one from the 1920s with it's complete wardrobe). 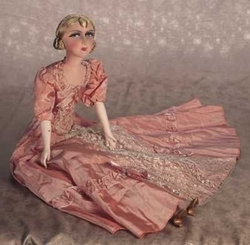 French cloth salon doll as sophisticated 1920's lady, with painted face, upper glancing eyes, real lashes, close dmouth, blush and eye shadow, elongated throat, blonde floss hair in fanciful coiffure very elongated slender limbs with composition lower limbs, painted good heels, original peach taffeta gown. Excellent condition. Circa 1920. And this Joel Ellis doll that Gail Wilson would have loved if her face was in better shape, maybe she can restore it! 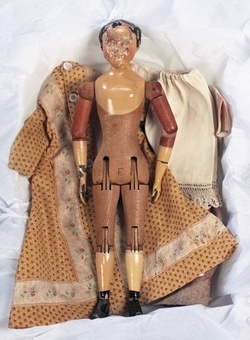 12" American wooden doll by Joel Ellis with unusual brown painted hair, wooden dowel-jointed body, pewter hands and feet, along with original dress, undergarments, woolen petticoat. Finish is original albeit very worn on face and hair. Circa 1875. My favourite is this mache doll. I don't know why but I love her bold features and black hairdo! 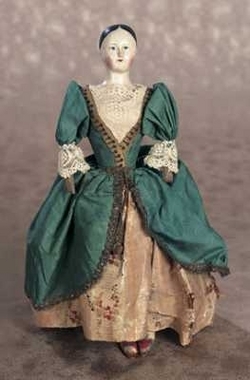 13" French paper mache lady doll with oval face, elongated throat, black painted hair, painted blue eyes, closed mouth, kid body with shapely torso and limbs, wooden "griffes" (claw-shaped hands) that are original. Very good condition, original finish and body. Circa 1840. ... I'm pregnant, it's my first-very-desired pregnancy... but I have been feeling lousy. Eveybody says it's Ok, the hormones, and so on. My mother says that the fatigue will pass by the time kids are out of home (granted that they don't come back). More optimistic reports say that I'll feel much better by the end of third month. I'm through my 11th week and keeping my fingers crossed. It has also being a crazy time at work. I guess this hasn't help either. So I have actually been out of the net... yes this is possible, but only in work-sleep-feed mode. 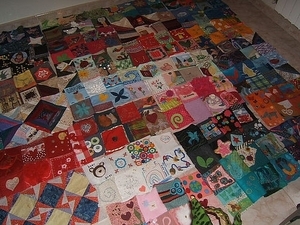 I have tons of mails unanswered... and yes a quilt to assemble. I have two days off next week so I have to try to sew a good pile of them. 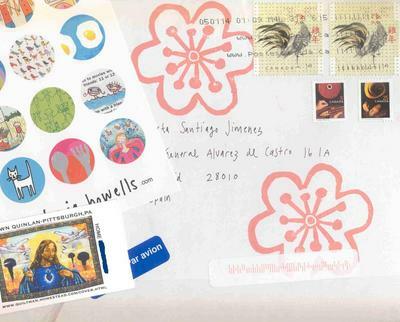 If you have send me a block and you want to know if I have received it the easiest way is to check http://www.flickr.com/groups/tsunamiquilt/. If your picture is posted there and you haven't posted it... it has arrived!!! If you have posted the picture by yourself you should have an standard comment made by iemoto ( my screen name in flickr) saying that ... it has arrived!!! Other way post a comment here or email ( slow answers...sorry) and we will try to sort out what has happened. Thanks to everybody that has sent congratulations and good wishes (slowly replying again) I hope that everything turns well and that in six months I will be able to show off my baby. I missed this month of Softies again. I have been postponing sewing a cat for A month of Softies, and having to do real life work last weekend made me miss the deadline again. This morning after making the real life deadline I could spend some time surfing the web, and seeing the wonderfuls Cats that everybody have done only made things worse. I'm madly in love with Wee's Buttercup and Sunshine, in awe with Loobylu's Cat Factory, impressed by Mimi's knitted cats and inspired by Ervilha's Softie. I really love them. I think that I'm going to start collecting Cats. And this is only the tip of the Iceberg, I can't wait to see the Gallery of the Project. Mimi was wondering if I was overwhelmed at having to put all the blocks together, well the answer to that question is that I’m just trying to ignore that the enormous task have to be done. But I have it on the back on my mind and tonight while the alarm clock was buzzing (I’m working this weekend) I have a wonderful idea about mounting the quilt. So as soon as I get some spare time (I’m working this weekend, did I tell you?) I can start sewing them. To all of you that have written offering help and I have not answered back please be patient. Help is needed but I need to organize ressources. Life is really interferring in dollmaking or craftmaking, I’m missing my dollmaking badly. The only thing that I manage to do is some knitting, at lunch time, conmuting, before going to work. I can pick my knitting for fve minutes, knit a few rows and just drop it. I can’t do that with dollmaking or any other craft I need tons of stuff, supplies, fabrics and beads just to pick the simpler colour scheme, so in five minutes I only get to open all the boxes, and get an untidy room. Alice Azul’s block inspired my search of knitted flowers, so far I have only been able to find a couple of patterns. Two flower patterns at On my mind, a rounded petal flower at Frogpond and some roses at Knitty (scroll the page until you arrive to the flowers). Most flowers are crocheted, I don’t have nothing against it, but I don’t know how to crochet and right now I just can’t handle learning a new craft. "paper piecing is a way of making intricate or complicated designs easy to stitch"
To try Paper piecing: "How to Paper Piece - Step by Step" .pdf and "Cutting the fabric for size and angles" .pdf from quiltseeds.com. You can also find some free patterns here, check her licorice pattern. Wow I'm learning a lot!!! 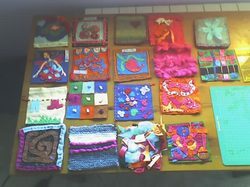 At http://www.flickr.com/groups/tsunamiquilt there are some fine samples of embellished Crazy quilting. For those of you that may be interested in this but don't have a clue of where to start I have collected some links. Second step embellishment: Now you'll have to choose from a large amount of different techniques from the classic embroidery to the most technologhical Image transfering. You can see more pics of blocks here. If you have a pick of your block and want to add it to the group but don't like to register send it to me.